Yonten Gyatso was the 4th Dalai Lama, (1589 – 1616). As a descendant of the people of Mongolia, he was the only non-Tibetan to be recognized as Dalai Lama (although the 6th Dalai Lama was a Monpa), and that after extended debate among his contemporaries. 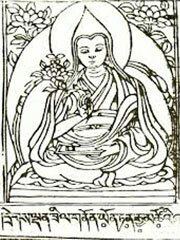 He was a contempory and student of the First Panchen Lama Lobsang Chokyi Gyeltsen.